Now that the trees have been planted and the growing season is revving up, it’s the best time to plant wetland plants along the shores of the new lake section. 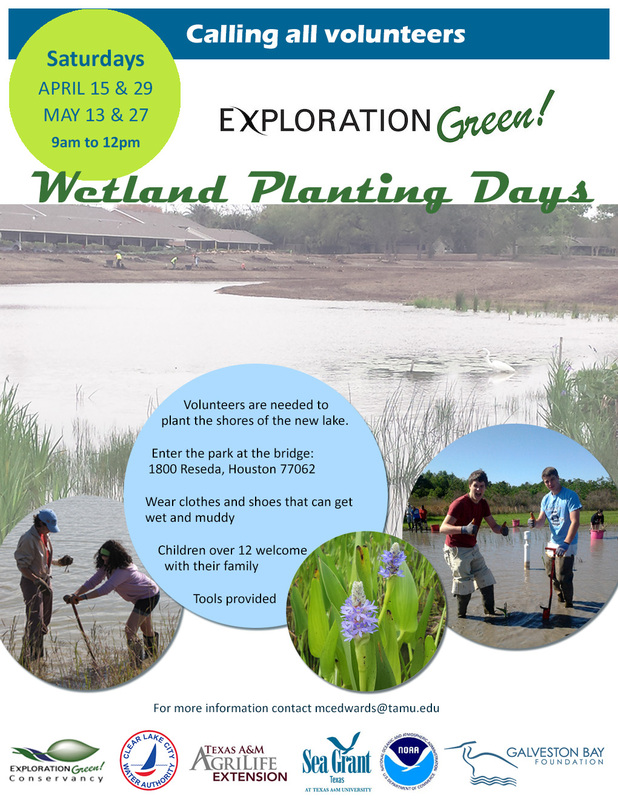 The public is invited to wade in and plant on four Saturdays, April 15 and 29, and May 13 and 27, from 9am to 12pm. Native species will be planted in the shallow margins, providing habitat to water birds, and natural cleansing of stormwater runoff. Wear shoes and clothes that can get muddy, sun protection, and bring a water bottle. All tools and instruction will be provided. Children 12 and up are welcome with their families. Exploration Green is in Clear Lake City, in the Bay Area. Park along the street and enter the park at 1800 Reseda. See you there! Mulch is a material spread on top of the ground to benefit soil and plant health, and make landscape maintenance easier. Wood chips, leaves, grass clippings, wood shavings, and compost all make good mulches.